«Fresh», «ecologic» and «regional».These Slogans from the supermarket can only exceed in comparison with the resulting products of the aquaponic- dome. Because, what could be more fresh than vegetables from your own roof? What could be more ecologic than controlling the growth by yourself? What more regional as just taking a few stairs for harvesting? In big cities as Berlin, roof gardens are an important topic of the future and the concept like Aquaponics is even smarter than only a patch on the roof! Aquaponics means the combination of Aquaculture and Hydroponics in one closed hydro cycle. Thus, all plants extract their nutrients out of the water of the aquaculture and through this process of nutrient removal the water is cleaned again. Plants are only nourished through the excretions of fish. Therefore production of vegetables succeeds without the adding of additional nutrients and compared to conventional methods of production Aquaponics is very resource efficient. The production is ecological, healthy and sustainable due to no fertilizers, pesticides or antibiotics have to be used. Water consumption is low especially compared to other cultivation processes, as well as the Co2 emissions along the food chain, that is significantly reduced, which is why Aquaponics are environmentally friendly in every sense. Within the next years a district will arise, which gives space for change and experiments. The Aqauponic-dome will be first pilot project for the ECKWERK, the building in the north part of the Holzmarkt, where students are living and founders working. On its 3000m2 roof professional and future-oriented farming will be operated. The aim is a huge garden on the rooftop of Berlin, which ensures that a part of the needed food products is regional and locally grown instead of coming a long, resource-using way from somewhere else. The harvested vegetables and fish will be sold in our village shop and directly processed in our canteen and restaurant. Who does profit of the project? «Urban gardening» is more than just fashion- combined with new technologies it could offer solution approaches for some of our civilisation problems. We want this issue to be more in focus of the public and enable participation and research. Many people will visit the pilot project and students will question the methods of Aquaponis critically. But the most important question of «how does it taste» cannot be answered by anyone better than YOU – the supporters of the project!! The money of this campaign will be used for the purchase of the Aquaponic- dome, which by now costs a bit more than 20.000 Euro. The operating costs and other cost will be compensated by the Holzmarkt- cooperation. Some of the support we will get from the fine restaurant «Katerschmaus». They will prepare the food on Thanksgiving Day and believe us, they know how to do it. After the pilot project has finished you will get the report about all researches concerning the project- a pdf booklet with facts, numbers and pictures. You will get a guided tour through the Aquaponic-dome at the Holzmarkt. Our farmer Carl and his team will show you how it all works. In summer you will get fresh vegetables and herbs (about 1,5 kg) out oft the Aquaponic- dome, directly delivered to your home (within Berlin). The delivery dates will be arranged individually. Every research project hast to be evaluated- we will make an event out of it. We invite you to celebrate the Thanksgiving Day, Sunday the 6th October 2013, with us. There will be grilled fish, fresh vegetable and delicious salad- everything out oft our Aquaponics production, prepared by our KaterSchmaus team. Invite your employees, colleagues or friends to a private and individual guided tour through the Aquaponic project. It includes fresh herbal snacks and a glass of good wine for everyone (Max. 10 Person). For all Swiss friends: You and 9 of your friends will get an exclusive guided tour through the worldwide first Aquaponic-Farm in this vein. Our partner, the «Urban Farmers», practice on 250sq professional agriculture and fisheries. On top you will get a portion of fresh vegetables to taste. Invite your employees, colleagues or friends to a private and individual guided tour through the Aquaponic project. It includes fresh herbal snacks and a glass of good wine for everyone (Max. 10 Person). And we invite you and one more person for a exclusiv Aquaponics-Dinner at Katerschmaus, includes a good bottle of wine. Invite your employees, colleagues or friends to a private and individual guided tour through the Aquaponic project. It includes fresh herbal snacks and a glass of good wine for everyone (Max. 10 Person). And we invite you and three more person for a exclusiv Aquaponics-Dinner at Katerschmaus, includes two good bottle of wine. For us, the Holzmarkt is not just a place with history. In the name we see the future, and we see program. In the Holzmarkt we think of nature, economy and culture at the same time. We open up and create space for creativity, to live and work. 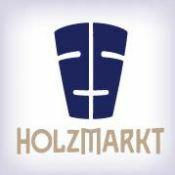 The Holzmarkt will attract people from Berlin and all over the world to delight, inspire and connect them. You will find peace and fun, work and entertainment, and be able to participate and enjoy. Sustainability and change for us are not a contradiction. We produce energy, a field of tension between modern architecture and a Holzmarkt (timber market) in the sense of the word. New technologies and crafts stimulate each other. The Holzmarkt makes room for the new, does not remain static.